A family on safari were left in a serious dilemma after a lion bit through one of their car tyres, leaving them stranded in the middle of South Africa's Kruger National Park. 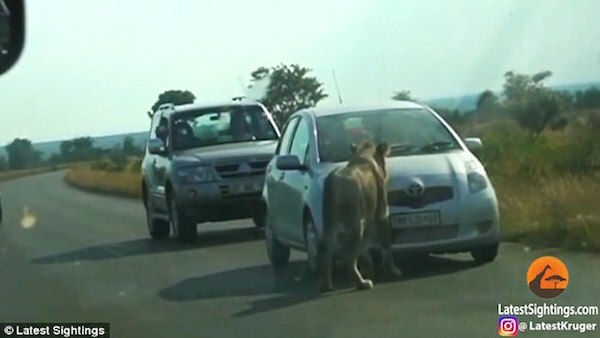 Schoolboy Sean Obeirne was with his family when he noticed a large, male lion come up to the back of their car and stare in at them. 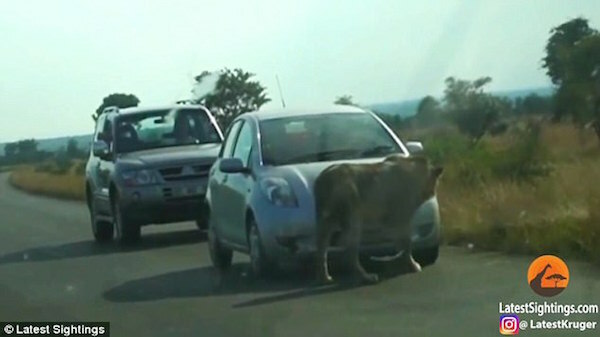 One of the lion singled out another oncoming car and after sniffing around the bonnet and bumper moved on to check out the tyres. The lion then unexpectedly clamped its jaws on to the tyre, while the family watch from inside recording the events unfold. Suddenly a loud bang and hissing of air is heard as the tyre exploded, forcing the shocked lion to leap backwards. But the family were then left trapped inside the car dozens of miles away from help and with no way of changing the tyre surrounded by the pride. 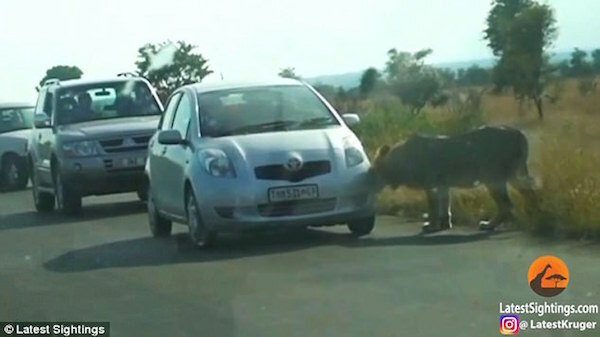 Still filming, Sean Obeirne's family pull alongside the stricken car and gets them to drive along the road, away from the lions where they park next to each, other using car doors as shields. Sean's father gallantly gets out his jack and changes the car tyre so the family can carry on their way. Sean said after seeing the lion begin biting the car tyre: 'There was an almighty bang and the lion investigating the car ran off in fright. 'It took a second to register what had happened but once we had, the intensity of laughter tripled. 'We laughed and laughed and only after a monumental giggling session did we realised that perhaps this situation was not so funny for occupants of the affected vehicle. 'We then went over to investigate and offer a helping hand. 'To my shock one of the people in the now three-wheeled car was a prefect at my school, an older cool boy, who I otherwise would never have interacted with outside of school. 'Once the shock had faded, my dad began helping to change the tyre. We made sure we were as far away from the lions as the car with the flat tyre could manage.